Yokogawa Electric Corporation has developed the TDLS8100 probe type tunable diode laser spectrometer as part of its OpreXTM Analyzer family. The device is aimed at applications in the oil, petrochemical, power, iron and steel, and other industries that need the capability to directly measure oxygen or carbon monoxide gas concentration at high speeds. With its combined light launcher and detector, this new probe type tunable diode laser spectrometer significantly lessens the requirement for the installation of flanges*1 and scaffolding, and therefore allows a 50% or larger reduction in installation costs. 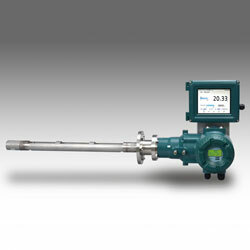 The device is designed for use in the analysis of flowing gases where there is a demand to decrease installation costs. With the addition of the device, the company will be ready to give its customers a bigger range of choices on solutions that can help them secure safe operations and maximise energy efficiency. The company also plans also to release a model for the measurement of ammonia and hydrogen chloride gas concentrations.